The fish are starting to get active…. I think I was correct in stating that aggressively removing leaves and other organic material from the bottom of the pond in fall and winter really reduced the amount of string algae I saw. However, I really did leave off a step in the process in the spring, and the pond suffered a bit for it. First off, cleaning or replacing the filters in spring is a requirement, not an option! In parallel with this, I needed to use the garden-hose siphon to pull out muck from the bottom of the pond and from the biofalls and skimmer. This was only a 45 minute job, and all the murky water went towards watering (and fertilizing) the garden plants. This all needs to be done in late April or early May. Secondly, I forgot to put bacteria in the pond frequently enough. I was putting in a dose once a week, but I was supposed to put it in daily for two weeks when the pond starts up in the spring. Once I realized this and started that regime up, the water cleared up considerably. Next year, I’ll start up the 2-week spiking right after the pond cleanout. The pond looks pretty good now that I’ve completed these two steps and the plants have started growing and the fish are eating more (and thus dislodging the last bits of string algae from the bottom of the pond). Admittedly, the pond water is amber-colored, but my goal is not a swimming pool but a wildlife pond. As I was hoping (but doubting), I’ve gotten a single wild iris bloom. It’s gorgeous! 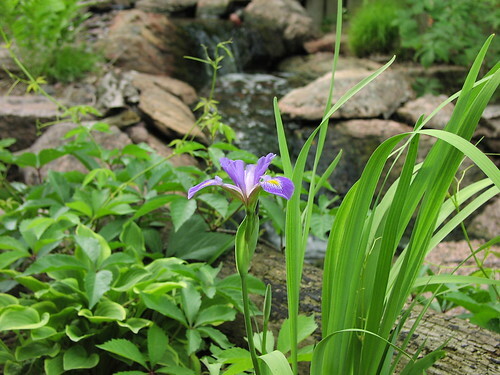 I’m hoping that a little aquatic fertilizer will encourage my other older iris to bloom as well. I saw my first American redstart near the pond this weekend, too, but I still haven’t seen any cicadas anywhere. 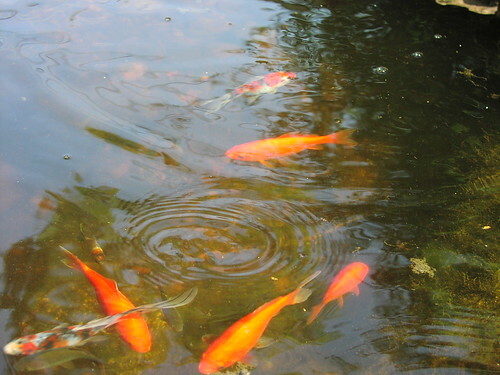 I’ll post soon on the pond and its fishy residents – I made some mistakes this spring, but I’m trying to learn from them. 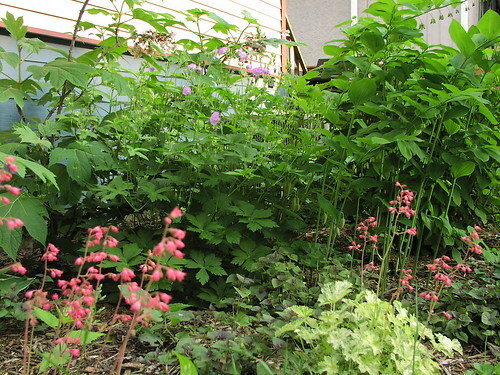 The heuchera (foreground) is in bloom; the wild geranium (top) is still in bloom; the Solomon’s seal (Polygonatum biflorum – upper right) has loads of unopened buds. No cicadas are evident in my neighborhood yet, but perhaps the cold weather we had a few days ago is keeping them underground. I’m not in any hurry to start pulling them out of the pond or crunching them while walking to the El! I wouldn’t mind a little rain, though – half an inch for all of May so far is just not enough. 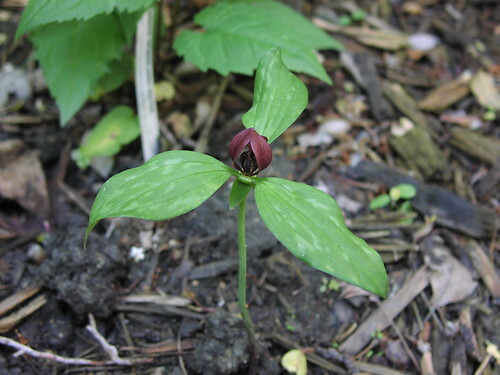 Prairie trillium (Trillium recurvatum) is now in bloom. I planted this last spring and just put in 3 more this weekend. I took this past Friday off for planting since I wanted to get the majority of it done before the cicadas emerge in a few days. After buying a bunch of herbs, a flat of French marigolds, and some pond plants, I arrived home to find that my shipment from Prairie Nursery had arrived. I enjoy planting, really I do….but I went a bit overboard and now have a bum knee to show for my effort. And I still need to plant most of the marigold flat and a handful of vegetables I haven’t bought yet! I’m guessing that a bit of ice and rest and some strengthening exercises (which I have neglected in favor of gardening) will help immensely. Good thing that it’s still in the 40s outside so I get that rest! I’m seeing a lot of irises blooming around town, but there’s not so much as a bud on my wild irises (Iris virginica var. shrevei) in and around the pond. It appears that it’s supposed to bloom in May to early June, but this is also the north end of its range. I suppose I should just enjoy the foliage, but I’d like at least one flower. For now, I’ll just appreciate the amazing show that the wild geraniums are putting on, and wait for the peonies that are budding right now. 16 May – hooray for rain! 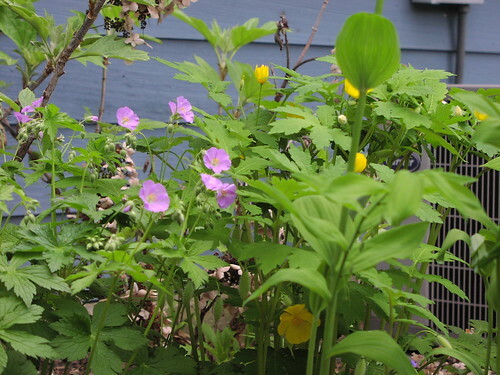 Wild geranium (lavender blooms) and celandine poppy (yellow blooms) with Solomon’s seal in the foreground and oakleaf hydrangea in the back. I was really hoping that the predicted showers would show up yesterday, since we have had hardly any rain this month after enduring a long rain-free period in April. We did get nearly half an inch, and I’m eager to walk through the garden this morning to see if all the droopy plants (Dutchman’s pipe, I’m looking at you) perked up. The pond is really looking nice after its spring cleaning. We lost our first goldfish in 18 months last week, but that poor shubunkin had a malformed mouth and wasn’t looking good after the winter. Everyone else looks great, particularly the baby fish spawned last year. The shubunkin babies look fantastic, and the goldfish babies look, well, dark. From what I’ve read they’re big enough to turn golden now….sound of tapping fingers… I think I need some of that garden patience with the pond, too. And I saw my first bluebird this past weekend! It was sitting on our pebble “beach” taking a bath in the pond. I’m guessing it was a migrant, but how cool would it be to have it living in the neighborhood? I would love to see it at least once again, since I didn’t have time to properly identify it outside of its being blue and not a blue jay. 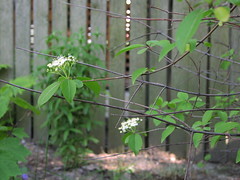 Blackhaw viburnum (Viburnum prunifolium) – above – This shrub was planted in fall 2005, and didn’t bloom last year. I was a bit worried, but it bloomed like a champ starting a week ago. 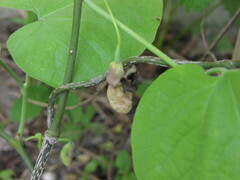 Dutchman’s pipe (Aristolochia macrophylla) – below, looking a little sad due to the hot weather and lack of rain. Wild irises…I hope! I haven’t seen any of them bloom yet, but my perennials have been looking very good so far this spring. You should really divide your water lilies at some point before not one but two rhizomes start crawling out of the planter basket (click on the photo to see this in more detail). Oh, and before the roots grab onto every single rock at the bottom of the pond. The goldfish seemed rather amused by the 10-minute weight-lifting session required to haul this puppy out of the pond. Honestly, though, I bought this lily in early fall of 2005 – I didn’t expect that it would become the creature from the Black Lagoon so quickly! All’s well that ends well: I cut off a 2-inch section of rhizome which had some lily pads growing out of it, and placed it in a much larger basket. Everything else is being composted outside of the rocks entangled in the roots, which got put on the stony beach you see here.